Andy Carvin might have the title of providing Web 2.0's first online baby, but we (OK, I) will be creating a bit of a Web 2.0 wedding experience as we get married in the Mairie de Binic, Brittany, France at 3pm on Juillet 7 (see it on Multimap). In France, when you get married you must give your vows under a photographed portrait of M. Chirac before the mayor (who is one of Morgane's distant relations) dressed in his tricolour sash. It will certainly be an audio visual spectacle as we have our piper being imported in person from Dunoon, my home town, and most of my family and many close friends are making their summer holidays out of the party. 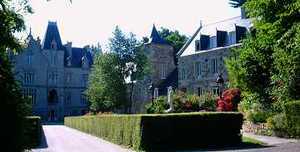 The reception is in the Château du Val. Not very Web 2.0. We also have our rather un-Web 2.0 wedding list from John Lewis (although I did get to go around the shop with an ultraviolet scanner). Hey, maybe we can get you guys on Hitchhikr at least! I hope everything goes well on your big day. I'll be looking out for the photos on Flickr. All the best for the big day Ewan and Morgane! mcleroux is the combination of our names, hence the slightly unique tag. Congratulations! It is a joy to have a job you love. But the whole world is better when you get to spend your life with the love of your life! I often tell my husband of 13 years that I am so glad that I get to be married to my boyfriend! Best wishes to you and Morgane! And remember, when you go on your honeymoon, leave the blogosphere, we'll be here when you get back! From the picture and description it looks and sounds like a beautiful venue for the wedding. All the best to you and Morgane. Congratulations on the wedding Ewan - and on the forthcoming baby! I've now created my own Wed 2.0 blog about Humanist ceremonies in Scotland and I look forward to telling you all about it at one of the coffee mornings soon!